Among the treasures on show at this year’s summer opening of Buckingham Palace, the Australian State Coach was a gift to Queen Elizabeth II by Australia on 8th May, 1988, to mark the Australian Bicentennial. The coach – the first to be built for the Royal Family since the Coronation of King Edward VII in 1902 – was built by Australian WJ “Jim” Frecklington who also designed the Diamond Jubilee State Coach. 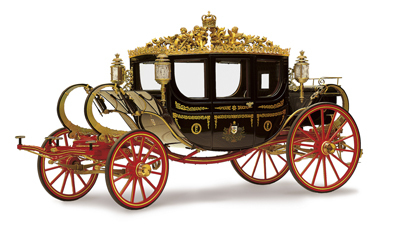 The coach, which is usually kept in the Royal Mews where it can be viewed by the public, has been used at the State Opening of Parliament and other occasions involving foreign royal families and visiting heads of state. It was also used to carry Prince Charles, the Duchess of Cornwall and Michael and Carole Middleton back to Buckingham Palace after the wedding of Prince William and Catherine Middleton. It was last used to carry the Duke of Edinburgh and Señora Rivera, wife of the president of Mexico, on a State Visit in March this year. The summer opening of the palace runs from 25th July to 27th September. The coach will be on display in the Grand Entrance portico. WHERE: Summer Opening of Buckingham Palace (nearest Tube stations are Victoria, Green Park and Hyde Park Corner); WHEN: 25th July to 31st August – 9.30am to 7.30pm daily (last admission 5.15pm)/1st to 27th September – 9.30am to 6.30pm (last admission 4.15pm); COST: £35.60 adults/£20 under 17 and disabled/£32.50 concessions/£91.20 family (2 adults and three under 17s); WEBSITE: www.royalcollection.org.uk/visit/the-state-rooms-buckingham-palace/plan-your-visit.